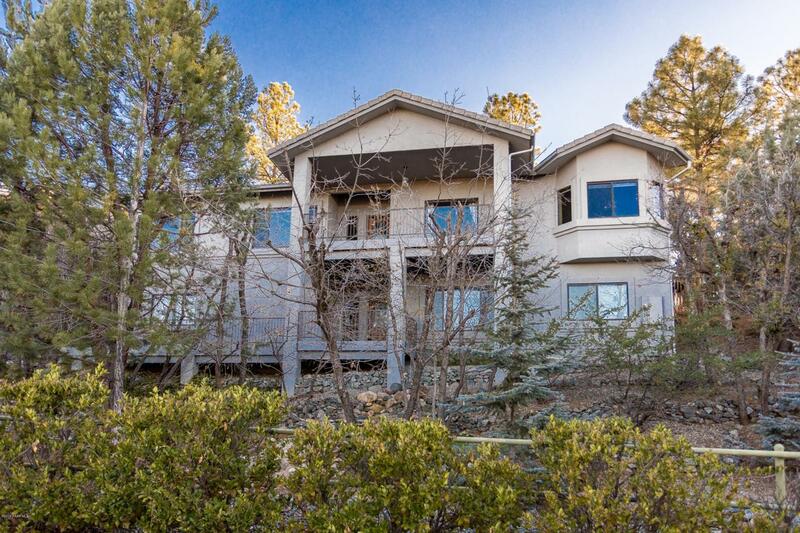 Situated on a prime view lot with mature trees & native vegetation that boasts long distance panoramic views of Granite Mountain, Thumb Butte & city lights, this home is located in one of Prescott's most desirable subdivisions! Upper/main level offers split bedroom floor plan, gourmet kitchen, master suite as well as additional bedroom & bath, large living room and dining area with soaring vaulted ceilings. Both living room & dining area have fabulous views, and are accented by gleaming hardwood floors, and have access to front trex deck which offers a great extension of the home for entertainment and enjoyment. CONTINUE:Kitchen boasts beautiful raised panel oak cabinetry with built in wine storage and under cabinet lighting, gorgeous granite countertops & splash, appliance garage, 5 burner gas cooktop in island with breakfast bar, & stainless appliance package including wall oven (not microwave). Master suite has same impressive views, massive walk-in closet, dual raised height vanity, separate shower & large garden tub plus private water closet with built in linen storage cabinet. Lower level consists of full in-law suite which consists of full kitchenette, living room, bathroom, spacious bedroom & walk-in closet! Backyard & patio are fenced for pets and has mature landscaping & private setting!